Spiro, Gyorgy. “Captivity”, translated by Tim Wilkinson, Restless Books, 2015). 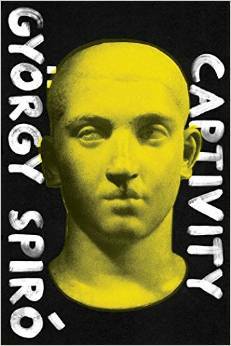 Gyorgy Spiro’s “Captivity” is an epic historical saga set in the time of Jesus about a Roman Jew on a quest to the Holy Land. The book has been a literary sensation in Hungary, home of the author and now it has been translated to English speakers can enjoy it as well. Set in the first century A.D., between the year of Christ’s death and the outbreak of the Jewish War, the book is the story of the adventures of the feeble-bodied, bookish Uri, a young Roman Jew. Uri’s father is frustrated with his son and so he sends him to the Holy Land where he hopes Uri will be able to bring some prestige back to the family. Soon after arriving in Jerusalem, Uri is imprisoned by Herod and meets two thieves and Jesus before their crucifixion. Later, in cosmopolitan Alexandria, he has a scholarly and sexual awakening but because he is Jewish, he also faces a pogrom that he manages to escape. Upon his return to Rome, he finds an unexpected inheritance. This is a story that includes Jewish history, and adventure as it tells its tale of family, fate, and fortitude. At more than 800 pages, we are reminded of old-fashioned historical novels about the Roman Empire that attempts to view all history from the rise of Christianity to the vices of the Roman emperors but through a distinctively Jewish lens. Spiró drew on the Roman histories of Tacitus and Suetonius, the Jewish writings of Josephus and Philo, and the Christian Bible and the Talmud, which preserves many features of Second Temple-era Jewish life. From these sources we are told about three distinct Roman cultures, each focused on a different metropolis– the politics of imperial Rome, the religious fervor of Jerusalem, and the ethnic strife of Alexandria and it is in these three cities where the novel is set during the period that spans the death of Jesus, in 33 B.C.E., and the destruction of the Temple, in the year 70. Gaius Theodorus is our guide here and under the Jewish name of Uri, he takes us to the Jewish communities in these three cities. We meet him first as a plain young man without a goal and without a purpose. He lives with his family in Transtiberim, the Jewish neighborhood of Rome that sits on the other side of the Tiber from Rome. Uri is good a languages and he has a god brain but really has nothing else going for him—he is thin and ugly and he has very poor eyesight and this prevents him from doing any kind of physical labor. Nonetheless, he, unlike his grandfather who has been a slave and his father who is just a freedman, is a Roman citizen. As such, he is entitled to free provisions from the Roman government. This is how he helps provide for his family. His mother gets no affection from him and his father shows him no affection. Unlike other novels, the characters and the plot are not as important as the setting and while Uri seems to be the main character, he has nothing to distinguish him. Because he is so passive, he seldom does anything—things happen to him instead and is basically just an observer of the historical events that happen around him. He starts out weak and with poor eyesight, but when it is necessary, he incapable of surviving harsh ordeals and describing fine details. The main character is the world with its political institutions and social arrangements through which Uri moves. The first part of the book is set in Rome and we some interesting activities there that make us see how different the ancient world is from our own. Rome, at this time, was a place of brutality, hierarchy and corruption. These came together as to make the lives of all Romans insecure regardless of wealth and social standing. Uri’s father asked if he could sent his son away to get together with a group of Jewish pilgrims traveling from Rome to Jerusalem, bearing the annual tribute for the Temple’s upkeep. Even though Uri hates the prospect of leaving home and taking a long, dangerous journey, this becomes good for him later. He is able to escape Rome’s Jewish ghetto and gets the chance to visit two major capitals of ancient Judaism—Jerusalem, the religious center, and Alexandria, the commercial center. is just one of many strands that go to make up a complex portrait of what Judaism meant in ancient Rome. What we see here and what I believe that Spiro is telling us here is that Judaism was, and has always been, a diverse civilization, rather than a coherent ethnic or religious identity. I see the message of the book to say that Judaism was, and has always been, a diverse civilization, rather than a coherent ethnic or religious identity. This doesn’t mean that the Roman Jews are not committed to Jewish law—they keep strictly kosher, for instance—but it does mean that their relationship with the Jewish homeland is ambiguous. Finally arriving in Judaea, Uri experiences a kind of ambivalence with regard to Judaism. He is sent to a small village where he watches as Jews make one of the three pilgrimages to Jerusalem as ordered in the Bible. He feels alienation and is impressed by them at the same time. At the same time, Uri begins to feel the hardships of rural life. He really cannot do any kind of farm work and he is used to something very different from it. Then when he arrives Alexandria, Uri feels very much at home in a kind of ancient version of a modern metropolis that is filled with ethnic diversity, commercial activity, and tall buildings. For a moment, it seems as if Alexandria is going to be the answer to Uri’s and Spiró’s, Jewish question. Egypt seems to be a place where Greek and Jew live in prosperous harmony. Historically, we know that this did not last and Uri sees the pogrom against the Alexandrian Jews that Philo describes in his work “Against Floccus”. We see that assimilation does not stop or prevent violence; and by the end of the book, Uri has lived through the Jewish War, which showed that nationalism was catastrophic. Spiro sees Christianity, as a Jewish attempt to overcome gentile hostility by creating a new dispensation in which there was neither Greek nor Jew. We sense the deep pessimism or fatalism of the novel across the entire Roman Empire. What began as a look at the classical world evolves into a meditation on what Judaism meant, and means. What is really amazing about this book is that it is such a page-turner. After all, it took a great deal of research to write this and could have been terribly boring but it is far from boring. The prose is beautiful and precise, the characters are well developed, the plot is exciting and it is a wonderful read. This entry was posted in Judaica on November 20, 2015 by Amos.